"It never should’ve happened,” said Fox — and the Twitterverse was quick to agree. Fox News issued an apology on Sunday for an on-screen graphic that mistakenly indicated President Donald Trump was reducing aid to "three Mexican countries." During an early-morning segment on “Fox & Friends,” a full-width graphic at the bottom of the screen, known as a chyron, read: “Trump Cuts Aid to 3 Mexican Countries,” instead of conveying Trump’s statement that he is cutting foreign aid to three Central American countries: Honduras, El Salvador and Guatemala, due to the flow of migrants across the U.S. border with Mexico. The chyron stayed live for about 30 seconds — which was long enough for the Twitterverse to seize upon the error. “Chyron mistakes are no more serious than audio ones. But they are the ones that go viral,” news analyst Andrew Tyndall told NBC News. “It is a simple thing to assign an extra staffer to double-check on-air graphics and chyrons before they are posted — and the potential downside of a failure to correct a graphic mistake is so much more viral than for audio errors." Newsrooms make mistakes all the time and Fox News issued a correction. But this highlights an underlying problem in the news business. Did a Latino write that chyron? I would be surprised if that was the case. Rep. Alexandria Ocasio-Cortez, D-N.Y., took the opportunity to take a shot at the network, which has been highly critical of the young politician. "These are the same folks who assert their superiority by belittling the intelligence and good faith of others,” she tweeted. One journalist pointed out a potential "underlying problem" in the news business, questioning whether Latinos were underrepresented in the newsroom. "Did a Latino write that chyron?” CBS News reporter Camilo Montoya-Galvez tweeted. 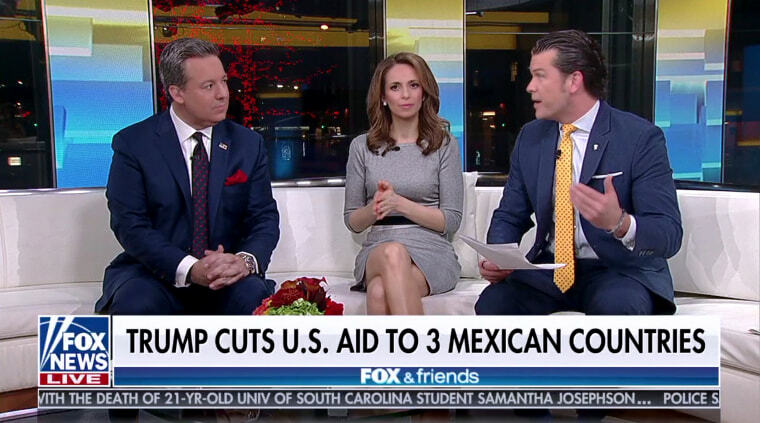 Others in the Twitterverse took the situation more lightly, comparing Fox's "three Mexican countries" to the movie "Three Amigos." The error was first spotted by a Twitter account called @BadFoxGraphics.